You are here: Home » Which conference is best at the top? Which conference is best at the top? I see probably 10 separate links a day on Twitter about bubbles and bubble teams and who might be dancing and who might be pouting and, for the second consecutive year, scroll right on past them. Marquette is headed straight for the gym, so there’s not much catching up I need to do in terms of what the national consensus might be. But two days ago, I bit on a link and came away pretty dumbfounded. Tulsa (18). Record: 19-7, 12-2 in American. RPI: 39. 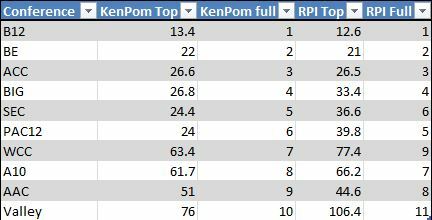 KenPom: 72. Sagarin: 65. Clearly, there is dissent among the computers about the Golden Hurricane. A gaudy record in a pretty good league (at least at the top) is Tulsa’s strongest selling point. A puny non-conference record that includes losses to Southeast Oklahoma State and Oral Roberts is not. There are some good opportunities left, at SMU and Memphis and home against Connecticut, but anything less than a sweep of those games could send Tulsa to the conference tourney still unsure about where it stands. Yea, no. I am not afraid to admit I have an irrational bias against the AAC stemming from an article I wrote two years ago, but that aside, there is no way a knowledgeable writer would write that. The AAC is not a pretty good league in any sense of the word, but let’s just focus on the top, as Forde uses to qualify his assertion. I went ahead and averaged the top half of each of the top-10 leagues, per KenPom and RPI and the results are below. Hey look the AAC is ranked 7th according to KenPom and 7th according to RPI. Taking a closer look at just the top half of the conference, you can really notice the difference. The AAC is closer to the West Coast Conference, Atlantic 10 and the Missouri Valley than the former BCS conferences. 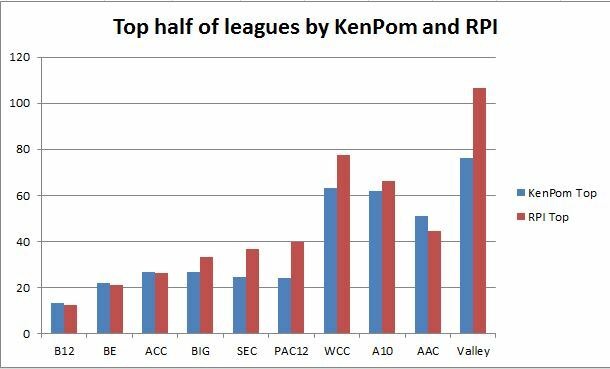 Obviously, taking a grouping of schools won’t tell you how difficult it may be to play one particular school, but on average, you are more likely to play a top 25 team in either the KenPom or RPI ratings in the Power-6. On average, the opponent is top-50 in the AAC. This doesn’t make the AAC bad, per se, but it definitely doesn’t make them a good league at the top. Why does this bother me so much, because perception truly does impact ratings, which impacts income down the line. If you asked the average basketball fan where the Big East ranked in terms of conference strength, most would probably put it closer to 10th than 1st. Yet, by any way you slice it, whether measuring the full league or simply the top of it, it is pound for pound the second best. Villanova is elite, while Butler, Georgetown, Providence and Xavier fluctuate between good and very good. At the end of the season I plan to look at the full ratings for the Big East again, and they have improved, but not by as much as the league has. The AAC gets to pit it’s top teams, only one of which is a top-25 team (with 0 top-50 KenPom wins this year), on ESPN every week, so despite them having a tremendously inferior product, they reap those rewards perception-wise. But that’s a discussion for another time. For now, I just wanted to make the point that no, the AAC is not good at the top. Saying so doesn’t make it true. Very nice article and well thought through. The “thinking things through” part is all too often lacking in sports “journalism.” Look forward to your end of the season analysis.